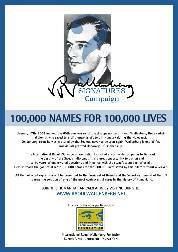 In order to expand the reach of the signature campaign ”100,000 names for 100,000 lives saved by Wallenberg”, we have especially designed a promotional poster. This poster will be distributed among organizations and institutions that would like to join us in this unique opportunity that aims at obtaining justice and finding out the destiny of this hero of humanity, taken by the Soviet army 60 years ago. To sign the campaign, please fill the form linked below and your name will be added to the thousands who already signed. 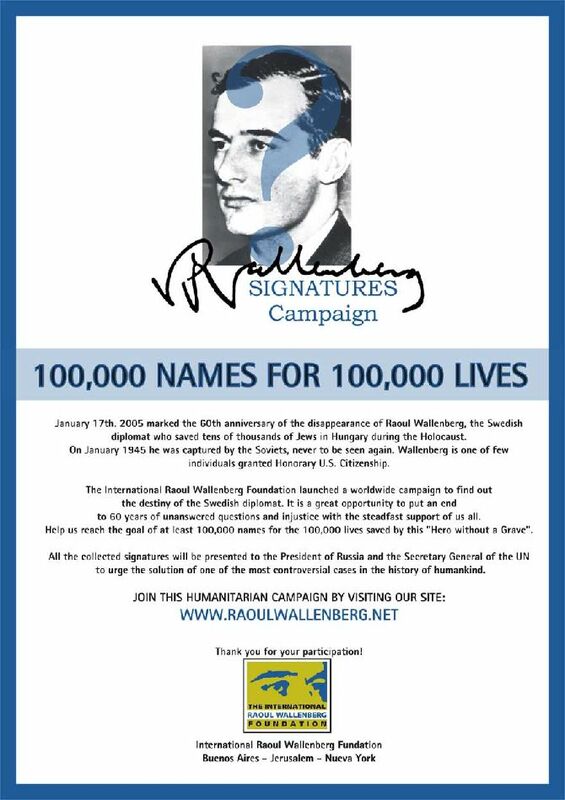 Our goal is to collect one signature for each life saved by Raoul Wallenberg in Budapest during WWII. Help us ask for the resolution of this case. The IRWF will present the signatures to the President of Russia and to the Secretary General of the UN.